It was cast near Paris, France in the Durenne ironworks in the early 1860's and featured as an exhibit in the Great Exhibition in London in 1862. It was bought for Edinburgh by Daniel Ross, a local gun maker and philanthropist, then it was transported in 122 pieces to Leith. After much dileberation as to where to place it, it was finally assembled in its current location. 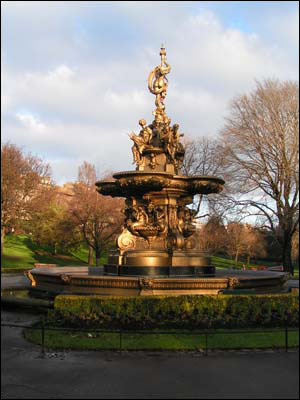 The gold coloured iron structure shows a standing naked woman at the top above four more seated naked nymphettes representing the arts, science, poetry and industry. Below the first tier is a collection of mermaids.The celebration of the naked female is typical of classical French design, but it wasn't to everyone's taste, Dean Ramsay (1793 - 1872) whose church, St. John's was nearby called the fountain "grossly indecent and disgusting"
The Ross fountain is a 'B' listed structure of historic importance.